Those of us living in Indianapolis are fortunate to be able to visit a number of public gardens including Garfield Park with its sunken garden, the beautifully manicured grounds of the Lilly House, the Indianapolis Museum of Art, White River Gardens, and Jens Jensen’s prairie style landscape at Riverdale, the James Allison estate, at Marian University. While each of these gardens is noteworthy, this site, the “home grounds” of Irvington’s 1873 Benton House, is unique for its display of pre–1900 heirloom plants. Thousands of daffodils, including some hybridized between 1777 and 1897, are in bloom during the garden’s annual Daffodil Week in early April of each year. Other spring bloomers include ground-hugging species tulips: T. biflora (1776), T. humilis (1860), T. marjoletti (1894), and 1875’s T. turkestanica. 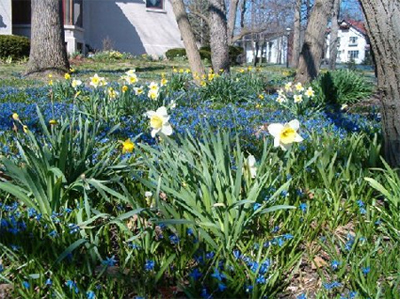 In addition, a number of “minor” bulbs such as crocus, snowdrops or Glalanthus nivalis (1597), and Allium moly (1596) show their colors while the lawn is carpeted with vivid blue Scilla siberica (1830) flowers. The dappled light in the home’s shade garden illuminates native woodland flowers including sky blue Virginia blue bells, Dutchman’s breeches, prairie trilliums, the bright golden paper-like petals of celandine poppies, and the creeping rhizomes of wild ginger. In late May visitors will relish the garden’s historic peony collection including the still desirable; after 156 years, P. “Festive Maxima” (1851), the fragrant rose-scented blossoms of P. “Madame de Verneville” (1885), And the deep rose blooms of floriferous P. “Edulis Superba” (1824). Iris lovers will see numerous heirloom cultivars including I. Mme. Chereau (1844), one of the first picatas, I. pallida “variegata”, the source of the sweet fragrance found in many of today’s hybrids, and I. “Caprice” (1898) noted for its sweet grape popsicle smell. Mid season brings into bloom Lilium tigirun (Tiger Lily) with its bold, deep orange recurved petals and “Florence Vaughn”, a canna with was the highlight of the 1893 Chicago World Fair. Close by, one can gaze on Hemerocallis species daylilies including the fragrant, narrow yellow petals of H. citrina; a nocturnal blooming daylily, H. dumortieri with its warm, yellow glowing blossoms and copper-colored petal backs, and the petite, and clear lemon flowers of H. fulva first brought to America during our colonial days. Those venturing to the garden’s Downey and Ohmer corner will stroll through a Victoria “fernery”, a garden of native ferns, including the billowy foliage of Adiantum Pedatum (Northern Maidenhair Fern) and the evergreen fronds of the Christmas Fern. Growing among the ferns are several species of hosta: H. Plantagenet (1838) with its large and fragrant white Flowers and H. Sieboldiana (1794), the parent of H. “Elegans”. 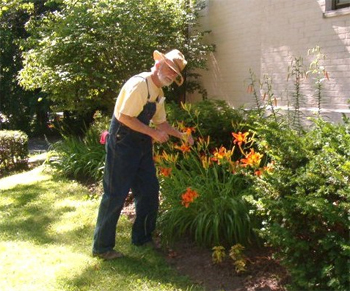 The garden is maintained by the through the generosity of the Irvington Garden Club under the supervision of master gardener Ed Myers. 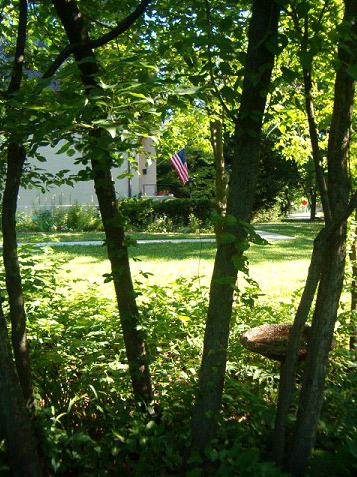 For more information on how you can support the Irvington Garden Club please visit their website.